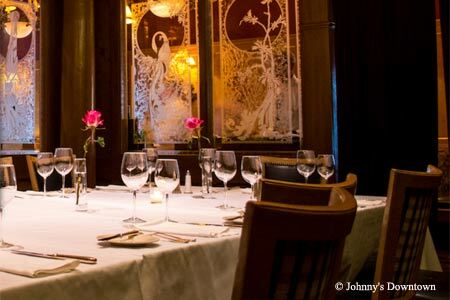 Johnny’s serves up French-inspired fare with old-world elegance. : Johnny’s provides solid proof that the Warehouse District is more than just a snazzy place to see and be seen. Bold flavors, seasonal ingredients and pleasantly upscale touches comprise the menu at this West Sixth hot-spot. Start with the oysters three ways (Rockefeller, grilled with roasted tomato and fried with a tasting of rémoulade). Follow it with a classic Caesar salad and then the homemade gnocchi or the medallions of veal Rossini served with shiitakes, foie gras and a well-balanced Cabernet demi. Desserts are worth the calories, so be sure to try anything that features chocolate. The wine list is well written, and the beer selection is serviceable.